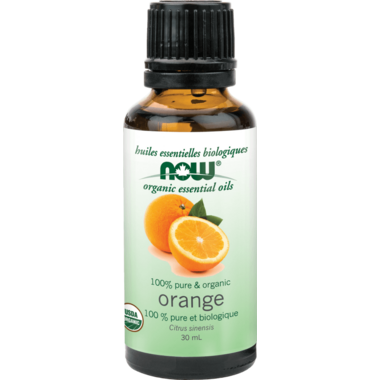 NOW Essential Oils Certified Organic Orange Oil is refreshing, uplifting, and invigorating! The citrusy aroma of orange oil has made it a favourite among aromatherapists and everyday users. In addition, it has the ability to inspire feelings of warmth and cleanliness. Mixes Well With: Citrus oils, clove oil, cinnamon oil, nutmeg oil. Directions: For fragrance purposes. For all other uses, carefully dilute with a carrier oil such as jojoba, grapeseed, olive, or almond oil prior to use. Please consult an essential oil book or other professional reference source for suggested dilution ratios. Ingredients: Pure, organic orange (Citrus sinensis) oil. Caution: Keep out of reach of children. Avoid contact with skin or eyes. If pregnant or lactating, consult your healthcare practitioner before using. Natural essential oils are highly concentrated and should be used with care. Our go-to essential oil in our diffuser and on our wool laundry balls. It is fresh though not over powering. Love this scent! I use it during the day and alternate it with Lemon oil. I live in an apt and my neighbours love it. This smells amazing, like a fresh squeezed orange, so glad I bought it and will buy again. Classic orange smell. If you like citrus you can't go wrong with this as part of your collection. This is still my favorite EO. I have purchased atleast 10-15 bottles. The quality is excellent. It smells just like a freshly peeled orange. Great price for one of my favourite essential oils. This scent is wonderful when placed in a diffuser or placed on wool dryer balls to lightly scent clothing. Also lovely when mixed with the lavender EO. Terrific orange scent. I use it often in my diffuser and bath products. Great price for an organic essential oil. I use it in the diffuser and everyone loves it. So fresh and juicy (smelling) - use this oil regularly in my diffuser. My daughter uses it on her lava beads when she's feeling down. Very uplifting. Great smelling oil- love it in my diffuser! This is one of my favorite product smells just like Florida oranges.It is a very mood lifting smell. I use this with my natural unscented laundry soap to give clothes a nice smell. I also use it to diffuse. Great product! This smells so good. I never want to be without this essential oil. It has fast become one of my favourites to put into my diffuser. It makes the house smell fantastic and it's brightens my mood. Smells like an orange when you just break open the peel. So fresh! I have tried many oils over the years and this particular one is my all time favourite. I buy it for other people as gifts all the time. Best quality orange oil hands down! A nice, fresh scent, and at a great price point. Would definitely purchase again. Love the orangey scent and flavor - great price! Love it, great price, organic, and smells divine. I just love this organic orange oil. I add it my toothpowder and love the great taste and clean feeling in my mouth after I have used it. Wonderful scent. I put 2 drops in my child's bath and it smells amazing - he loves it and it helps him relax. I trust the quality of the NOW brand - they have high standards and test their oils - plus low prices - can't be beat! Use another company oils but saw these at a great price so I thought I would try them and I love them. I got this on a whim and it smells so wonderful, especially with peppermint. very happy with it. Love this one. I have used it alone or mixed it with eucalyptus and/or peppermint in my diffuser. So refreshing and soothing, especially when I had a head cold. Great smell. Mix it with vanilla & cloves. Lovely fresh scent. Will purchase again. Very nice smell. I will buy it again for my diffuser. This is one of the essential oils I use in my homemade, natural carpet deodorizer. The house smells fantastic and no more expensive , unhealthy aerosols needed! Very pleased with my purchase. Smells really good. Would highly recommend this product. Its very uplifting and works really well with the NOW Vanilla. If you need a pick me up, this works great! I use orange lots in my cleaning products and I love the smell of it. A nice affordable essential oil brand for household cleaning. I really like the smell, and that it's organic. Plan on using it for cleaning and in the laundry should be perfect. Great price for an organic product. I use it with soap nuts for my laundry and it smells lovely. Smells great, so fresh and uplifting! One of the things I like to do is to put some on a cotton ball and put it in the vacuum before I vacuum, it releases the scent into the air as you vacuum, so you get some energizing aromatherapy while you clean. Smell was not as strong as I would have liked but a great buy considering the price. I add 3-4 drops of this oil to my water bottle and taste amazing! Instant detox water. Just like peeling an orange. One of my favourites. I love the smell of this... I mix with coconut oil for a wonderful smelling moisturizer. Also, it has many other uses. I use it in a mixture for weed killer (1/2 gal. water, 1/2 gal. vinegar, 1 oz. orange oil & 2 squirts of dish soap.) I've heard it also keeps ants at bay, if added to water & misted in the house. That would be much better than any pesticide. Of course orange & lavender is a nice mix in a bath. Smells delicious! Amazing value for an organic product. Pairs up well with clove and cinnamon. For fruitier aromatherapy I mix it with lemon, bergamot and mandarin. This orange essential oil smells deliciously wonderful!!! So good, that it makes me want to eat it! Even my brother, who is very particular about what aromas he likes, loves it and wants to use it as perfume.